The weekend was a flurry of activity for Innovatively Organized! 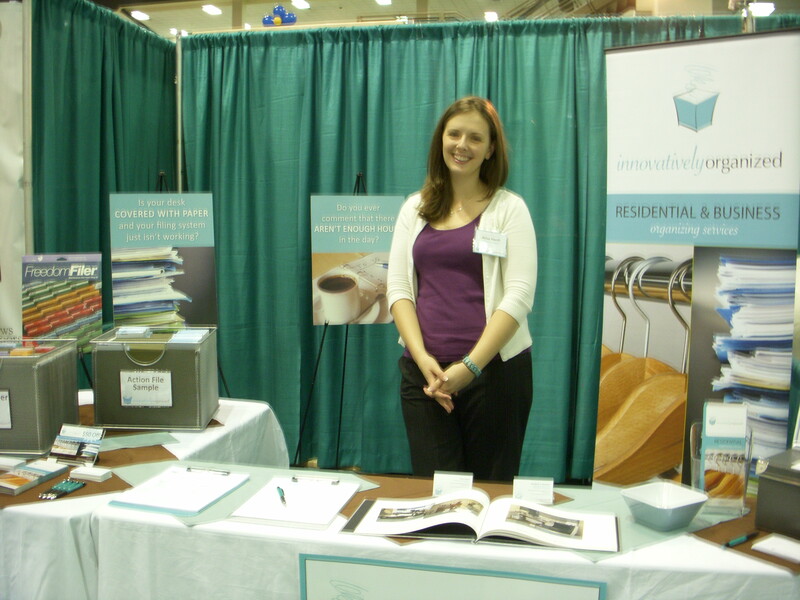 Our booth at the NW Women’s Show was extremely busy with hundreds of visitors stopping to find out more on organizing their homes and businesses. For those of you who aren’t familiar with the show, it’s the largest expo of its kind in the country, featuring a multitude of exhibitors aimed at the needs of women. There were vendors showcasing fashion, health and wellness, home decor, money matters, workplace leadership, food, travel and beauty. One of the most popular organizing questions we heard from guests was about paper management. Despite our addiction to communicating online and with electronic gadgets, everyone still needs to conquer the paper pile! Check out my paper management tips for more help with clearing the paper clutter. Also over the weekend was the first annual Vendor Fair & Ask the Organizer Panel sponsored by the National Association of Professional Organizers (NAPO). Attendees were able to meet local organizers and get questions about organization answered by a panel of experts. Keep checking my blog and your email inbox for more news on upcoming events from Innovatively Organized! This entry was written by Elizabeth Bowman, posted on March 8, 2010 at 11:14 pm, filed under Business Organizing, Electronic Information Management, Fun Stories, Paper Management, Upcoming Events and tagged clutter, Elizabeth Bowman, experts, general organizing, Innovatively Organized, NAPO, office, organize, organizing, Organizing Process, panel, Paper Management, professional organizing, tradeshow. Bookmark the permalink. Follow any comments here with the RSS feed for this post. Post a comment or leave a trackback: Trackback URL.